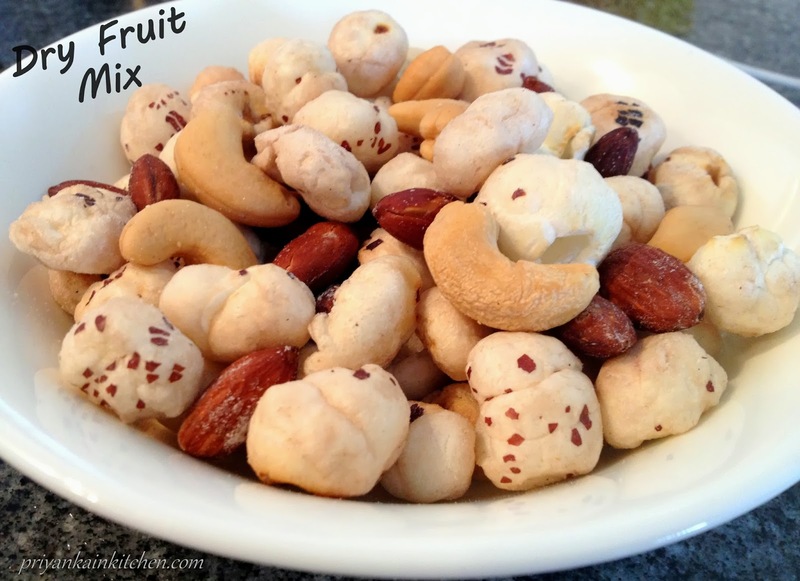 Dry fruit mix is a very tasty savory mix of roasted dry fruits that uses very less amount of oil and is packed with nutrition. I prefer to put a handful of it in my son's lunchbox. Also ideal as a munching snack with evening tea or while travelling. Not only for day to day life, its also ideal for "Hindu fasting". Just a hand full of it gives you enough energy and satisfaction to keep you going for a couple of hours. Ghee/ Clarified Butter for roasting. Take a tsp of ghee in a pan and add cashews to it. Stir fry cashews on medium heat until golden brown. Take out and keep aside. Add a tsp of ghee to the pan and add almonds to it. Stir fry them too on medium heat until done. Almonds tend to make crackling sound when they are roasted. If that sound stops coming, it means its time to get them out. Now add fox nut to pan and drizzle melted ghee on it. Remember fox nuts can absorb any amount of ghee added to them. So add according to your choice. I prefer to add 1 tbsp as the pan must already be having some remaining ghee in it, because cashews and almonds don't absorb ghee/oil. Stir fry fox nut for 2-3 mins. Now take them out in a microwave safe bowl and microwave for 1 minute. If you don't want to microwave, you can stir fry in pan for 3-4 mins on low flame to ensure they are crisp. Mix all three together, sprinkle salt and its ready to go. You can also add black pepper if you like it spicy.